I try very hard to not look at life in the reflection of a rear view mirror, but I do believe it is important to know where you are coming from as you move forward and the start of a new year is an excellent time to write about it. 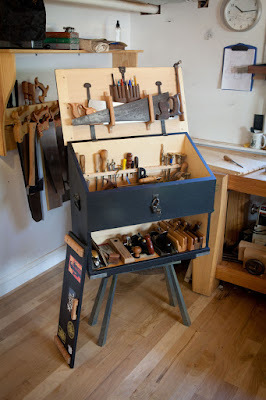 Looking at 2011 from a purely woodworking-centric point of view I had a very good year. I finished a decent amount of projects from a couple of wooden squares to a larger carved box. I was kind of inspired here by a blog post by the Popular Woodworking Magazine, where each of the editors name a few things that were their favorite new releases of the year. It got me thinking about what items I had gotten over the last year that had made a difference in my work. 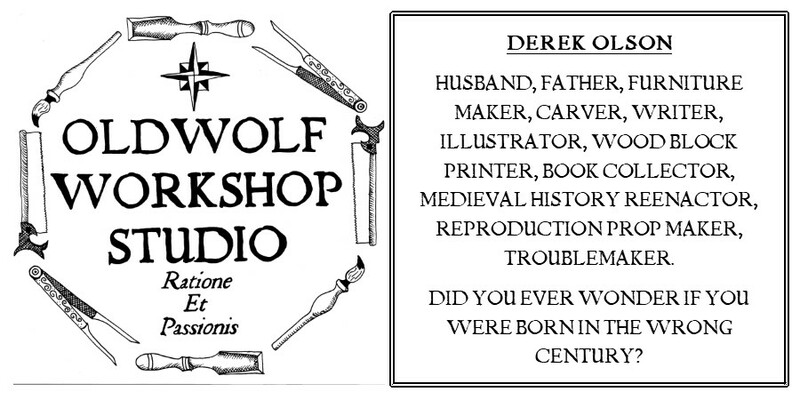 I came up with an Oldwolf Workshop Studio top five for 2011. I picked up a 14" Rigid brand bandsaw this spring. I want to be upfront, I am not recommending the brand, but I am saying the tool itself has changed my woodworking with one word, Resaw. Being able to simply and easily re-thickness wood has made it easier for me to process rough sawn lumber, (which is cheaper) and lumber I had riven apart myself (which is highly satisfying). There is a lot you can do with a bandsaw, I know, but so far, almost a year into ownership and the magic of turning stock into bookmatched parts still has a grip on me. If you don't have a larger bandsaw, I believe its a good thing. I don't have a brand to recommend, Obviously you get what you pay for. I started my foray into hand carving with two Phiel Chisels I picked up from Woodcraft in 2010. A shallow gouge and a "V" tool. In 2011 I found a set of 10 antique carving tools in a case at area antique store. I don't believe you need a huge selection of tools to get into carving, but a selection of a dozen is a nice luxury. t's given me enough experience that I know what I'm going to look for when I get the chance to pick up a few more. #3 : I Finally have Three Good Planes for Prepping and Flattening Stock. OK, This one might be bending the rules a bit because one of these three planes has been with me since the beginning. Prepping and flattening stock is such a basic, every time you work thing, and going through the paces with tools that just aren't up to snuff can make it a horrible pain in the naughty bits. I've had my wife's grandfather's number 5 Jack tuned up and working well for a couple years now, but complementing it with a truing plane and a smoothing plane have been challenging. My shop has to run on a very tight budget and new quality planes from Maine are out of my league. I make my way like I think a lot of hobbyist woodworkers do, I search around to find bargains where and when I can. I look at the area antique malls and flea markets. Now sometimes this means you kiss a couple frogs before you find a prince, but the search is fun and exhilarating all by itself. Early summer I picked up a very clean #6 and after sharpening the blade I immediately had very good results. I know a lot of shops use a #7 as a truing plane but I find am getting acceptable results with the #6, and I haven't found a good deal on a bigger Stanley joiner. Then this fall I found a nice #3 smoother at an antique store. It was also very clean and after grinding a nick out of the blade, I had completed the holy trilogy. Prepping and surfacing my stock is so much more enjoyable now. I filled one more big need in 2011 by getting my hands on a couple of joinery back saws from Mark Harrell over at Bad Axe Tool Works. First I picked up the hybrid small tenon / dovetail saw he so aptly named "Wyatt Earp." the truth is I had never owned a quality saw like this before and cutting with it was an epiphany. Everything I had been "making due" with up to that point was left sitting in the dust. The open handle design is super comfortable with a perfect hang angle for my hands and sawing style. I am so taken with the color of the mesquite handle my wife should probably be jealous. This saw became my go to problem solver for almost everything in my shop. I even used it's rip filed teeth to do some of my fine crosscutting work. I think that if my shop were on fire and I could run in and save one tool, this saw would be it. I followed up Wyatt Earp several months later with a 12" carcass saw, filed crosscut. By this time Mark was offering an open handle design on most of his saws and I chose to go for the American Black Walnut. In between my purchases Mark changed his finishing method for the handles from a shinier poly finish to a oil and buffed wax finish. It may sound like something of little consequence but I believe the difference in feel from one to the other is palpable. The oil and wax gets you such a better touch with the wood, and therefore a better connection to the saw and the cuts you're making. The continual quest to improve every detail of his work is what impresses me the most about Mark. It's one thing to buy a saw from a bigger tool company and get something that is just good enough. It's another to buy a tool from a craftsman who cares about the experience his customers receive when they are using his saws, and that care is evident in every element of his saws. I find I use the carcass saw nearly everyday in the shop, more than my beloved Wyatt Earp. If this fictional shop fire were to occur, I see no reason why I wouldn't grab both of these saws. I have two hands after all. It was a difficult decision to pick my number one favorite thing from 2011. My number one is hands down the most expensive purchase I have made in a long time, but it was worth every penny. It's a quality Nikon D3000 camera. In the shop I take a lot of photos. Yes I take them for the blog but also for my own journaling the build of a piece. Only a small fraction of the shots I take make it up here for everyone to see. This camera has given me the ability to take superior pictures in comparison to what I had before, but there is more to it than just getting decent documentation. In it's own way, this camera has changed the way I look at my work, made it somehow more intangibly intimate. As I pay more attention to the framing, lighting, and set up of a picture, I also connect again in a different way to the subject. It's almost like getting to look at your work through someone else's eyes, and that occasional shift in perspective can be a valuable insight. Well that skims over and sums up my 2011, Now I'm looking forward to a enjoyable and productive 2012 and I wish everyone else the same and more. Let's see where the ride takes us all this year. Those dark handled carving tools look very similar to a pair that I just got for the Old Tools List Galootaclaus gift exchange. Do yours have any owners marks? Mine came from Pennsylvania, I'm not sure where you are located, but those handles are quite distinct. Zach I hope you get the chance to read this again. I recently stumbled across a collection of these carving chisels on ebay in their original box, made by Miller Falls. Pretty cool actually. Zach, Those are my favorites of the collection, they have a roughness around the finial that almost makes them look hand forged, but if they were it was by someone who knew what he was doing. Unfortunately I have no owner marks or maker marks on mine, and I have even pulled a blade from the handle to see if there's any marks on the tangs and found nothing. I picked up mine at an antique store a block from our apartment in western Wisconsin. If you found yours in Pennsylvania that is very interesting. I agree the handle are very distinct, and I'd like to get more of this make if there are more out there. BTW. great blog! I've added it to my reader.